I have been asked quite frequently about the 080808 multi event coins. Well, here is a heads up peek look at them, with the artwork still in progress. 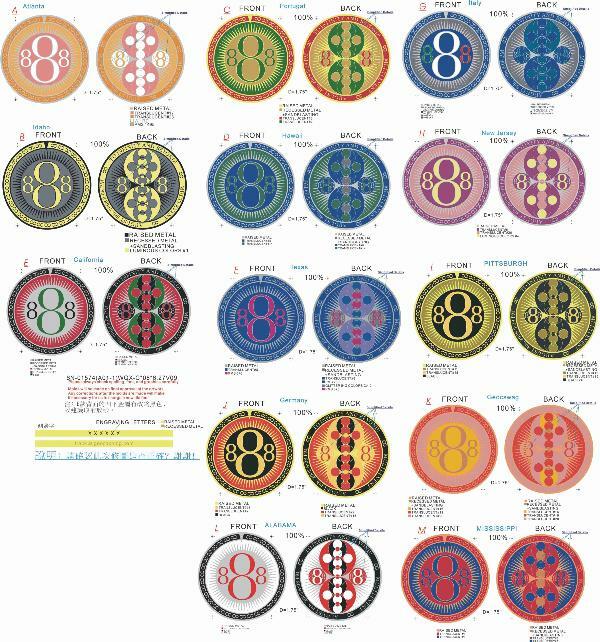 There will be 10 or so 080808 events sharing the same coin design with various color and metal changes. Available at each event location: Pittsburgh, New York, Atlanta, Idaho, Honolulu, Dallas, San Francisco Bay Area, Germany, Italy, Portugal and maybe a couple more locations. Love 'em, love 'em...*Love* THEM!!! Any Events out here for us New Englanders? OOOOOH...any word on what coins at what events??? I Like em where are the events at? Very cool. When will the event details be posted? Very nice! Looking forward to the NNJC's iteration. I will leave the coin event postings to the organizers. Still trying to come up with a place for ours since it's a friday. Now, now...don't steel (get it?) my thunder. Actually, the Pgh version is not posted yet...and amazingly enough, my take on a black and gold coin is a little different than the one posted (amazing because I had not seen anyone else's artwork before now). Still sorting out our location...but hope to have the final arrangements soon. There will be two events in Italy: one in Tuscany and one in South Tirol. Since exact venues have not been decided yet, the event pages are not online yet. Anyone interested in being put on the waiting list for the Italian event coins (the ones that will still be available after the event itself), drop me a line. 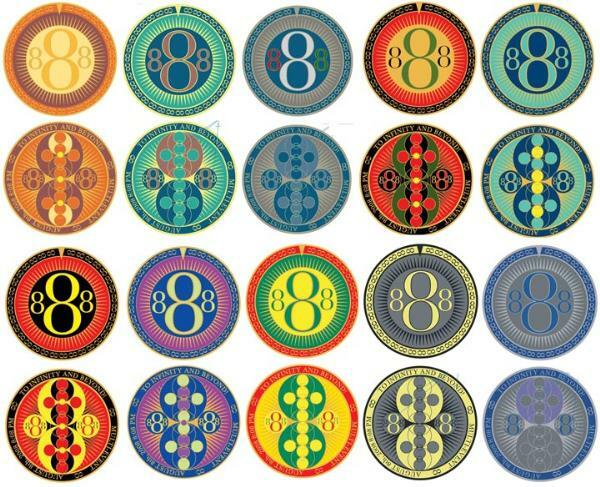 I'm interested in the coin from the 888 event that will be near the Midwest Geobash! Let me know if anyone has info about the event in Texas. Thanks! Our event was published this morning. We are having ours on Saturday. We have some people coming from out of town who won't be able to make it if we have it on Friday. After speaking to a few local cachers, GC1DCPW has been submitted. waiting for GC1DCBX to be published! Crazy 8's Event This one's in the evening in Northern New Jersey, I believe there is a South New Jersey event too. Thanks, I had started to put them on my watchlist, then decided to do a bookmark instead, but before I could start, we ended up going caching for the last 5 hours. im not familier with this event, but i so want one or more of those coins!! Any of the last 5 online yet? Thanks. I think I am missing 4. Italy has 2, Portugal has 2. Germany pulled out. Anyone want to run an event with a German coin? Thanks. I don't know what ones I am still missing. I have 11 bookmarked. Why isn't there one at MWGB? Probably because they won't allow any other events. would it be possible to get a coin or 2 for this event?? Will Arizona have their own event geocoin? I will be arriving on the 8th and hope to attend the event. Maybe the event hosts could each get a certain amount of the coins (if they are already in the minting process) to sell at our events. I know I can't do another hundred, but I could handle 10 or so extra. As a host of one of the events, I would like to try to get one of each of the coins from the other hosts, via trade or purchase. I thought this was a done deal? This is automatic. The hosts of each location receive one of each coin and in turn automatically send one of each coin to the other location hosts. Your order should be shipped that way. Very cool! I've been planning an event for 8/8/8 as well. Given I always go for 88 numbers on account of my caching name, I figured I had to do something on an all 8s day. I had originally planned to do a geocoin event, but between being slow getting the artwork together for the coin and having trouble finding a place to hold it, I decided to go with a different idea. Had I known there was a group event coin being made, I might have tried to get some for mine. Oh well. Might have to try and trade for one or two of these. I don't believe so, I don't think the Phoenix area event was planned until well after the coins were in progress. I hope you can make it, I'll look forward to seeing you there. How far is the event from the airport? Okay, great. I hadn't known about that.